Volcano Theatre Company is grateful to the nearly 250 individuals and companies who have purchased bricks and stones over the years. The progress made to date to restore this important historical site would not have been possible without you. Maintaining and improving the Cobblestone and Amphitheatre properties is an ongoing adventure. You can help by buying a BRICK. 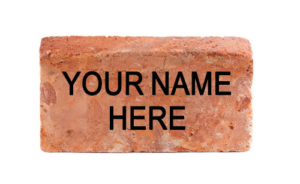 For each $100 donation, a brick engraved with your name will be added to the walkway in the Amphitheatre! Your tax-deductable donation will be greatly appreciated!